Ah, March. 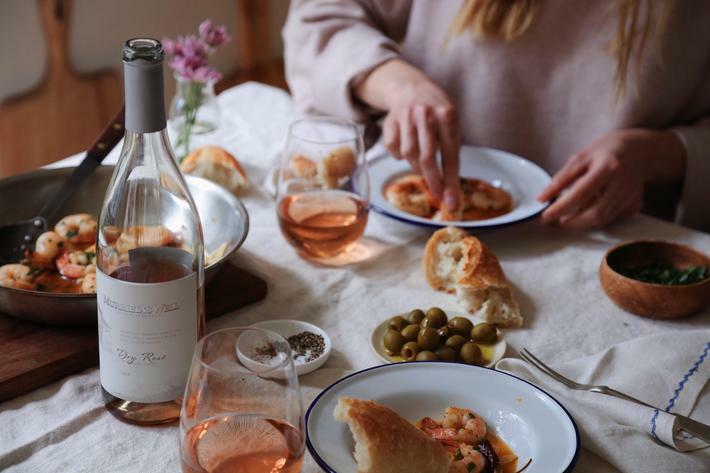 When we’re not sure yet if spring is here to stay, sipping rosé next to a sunny window is like a pinky promise in a bottle. 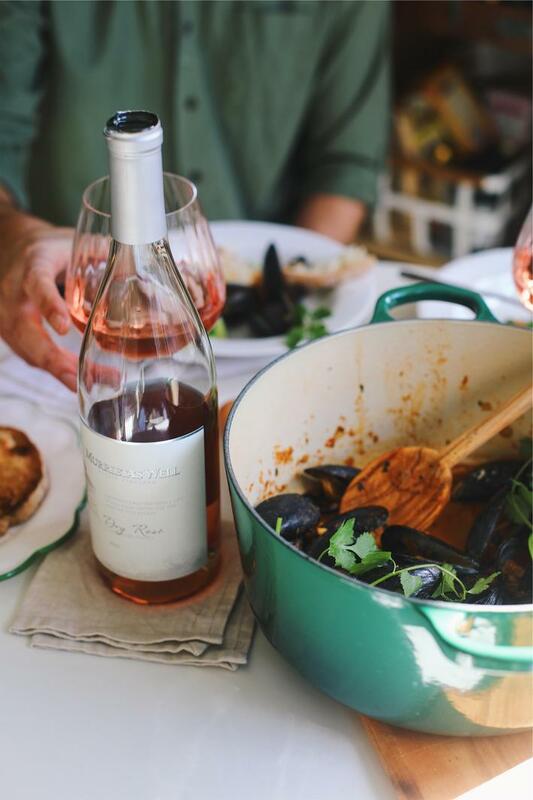 We’ve partnered with our friends at Murietta’s Well Estate Vineyard to bring you two date nights, for winter-meets-spring, featuring their new dry rosé. 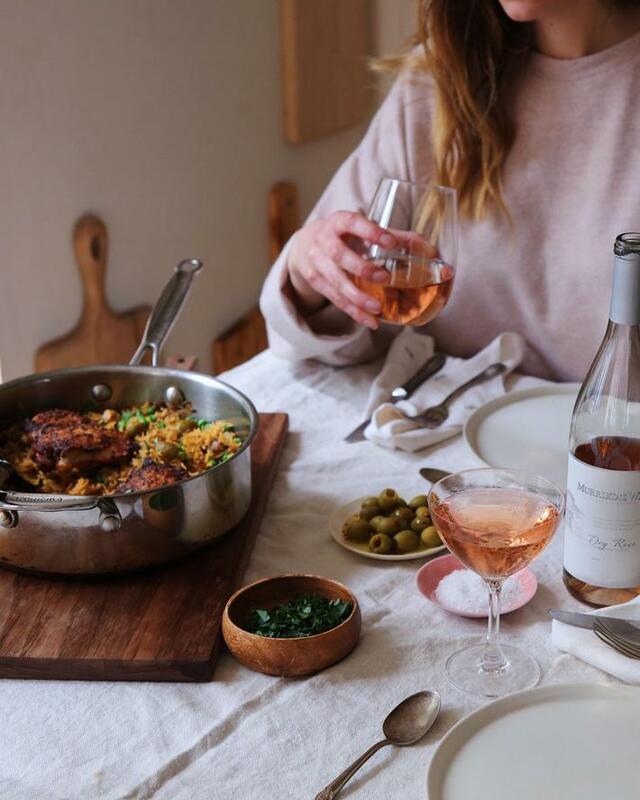 We’re transporting you to Spain and Thailand with fancy (but not fussy) 3-course meals, because we could all use a getaway with our significant other or friends this time of year. 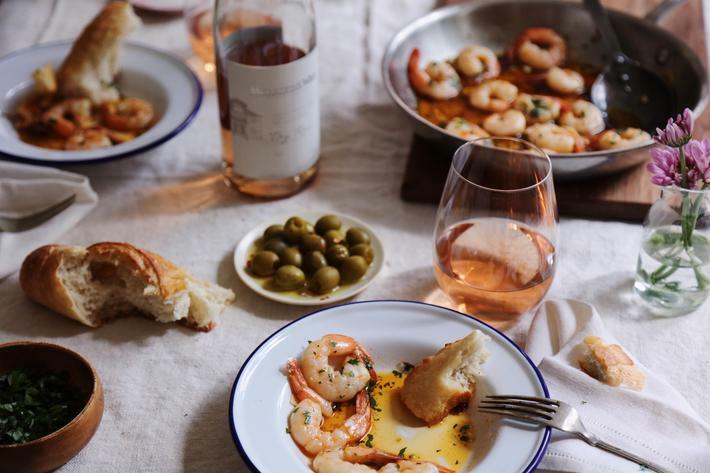 Spanish: Sizzling garlicky shrimp served with crusty bread. 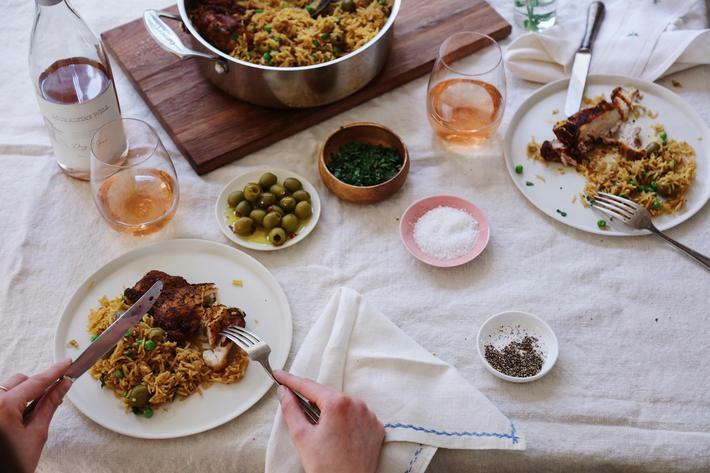 Arroz con pollo with saffron, rice, and olives—humble in price tag, but definitely not flavor. And finally a lavender lemon flan that is worth the effort. We promise it’s not too intimidating and we’ll walk you through it every step of the way. 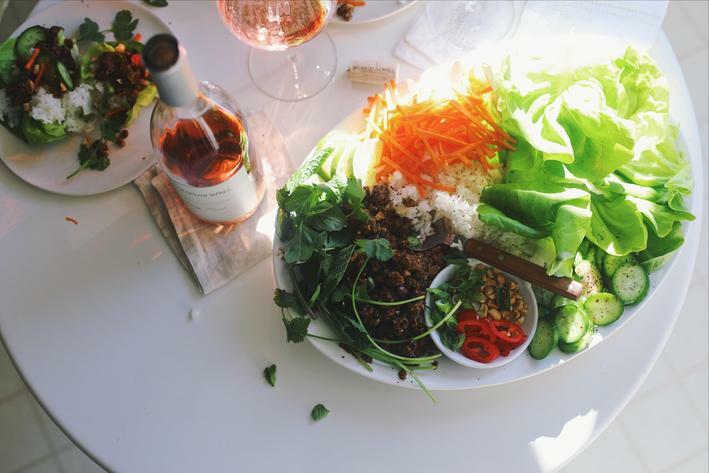 Thai: A fragrant pot of mussels and a gorgeous overflowing lamb wrap platter—there’s something about eating an interactive, assemble-it-yourself meal with your hands. For a sweet finish: cake that tastes like a buttery coconut cloud. Place shrimp in bowl; sprinkle with ½ teaspoon salt and pepper. Set aside. In a sauté pan over medium heat add the olive oil and when hot add the garlic, dried chiles, and cook for 1 minute. Stir in paprika and sherry. Add in the shrimp in a single layer and cook a minute or so on each side, until the shrimp turns pink. Serve immediately with crusty bread (+ lemon wedges, optional) and garnish with parsley. 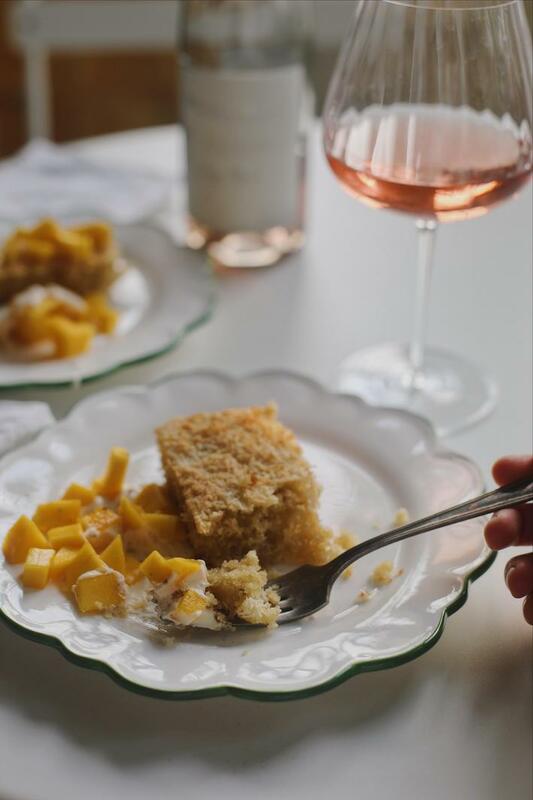 Pour stock in a measuring cup and crumble in saffron strands. Stir and set aside. In a small bowl mix cumin, coriander, both paprikas, oregano, and 1 teaspoon each salt and pepper. Rub chicken thighs all over with the spice mix. Set aside. Heat a skillet with high sides or a Dutch oven over medium-high heat. When hot, add 2 tablespoons oil and the chicken (in two batches) without touching so it gets nice and crispy. Sauté for about 3 minutes then turn over for another 2 minutes. Using tongs transfer chicken to a plate and set aside. In the same pot, add a little more oil if needed and lower the heat to medium. Add onion and sauté until very soft, about 5-7 minutes. Add garlic the last minute. Stir in the rice and cook for about 1 minute, it will smell slightly toasty. Pour in the stock, lemon juice, ¼ teaspoon salt and pepper, and olives making sure to give it all one good stir. Nestle the chicken thighs on top (don’t push them into the liquid, they should rest on top of the uncooked rice). Bring it all to a simmer and then cover with a lid. Allow to simmer for 25 minutes, or until rice is just cooked. Fluff the rice with a fork (remove the chicken if it makes it easier) and add the peas to warm through. Also add in the mixed herbs. Serve immediately. In a saucepan bring heavy cream, milk, ¼ cup sugar, lemon strips, and lavender to a simmer over low heat. Simmer gently for 5 minutes and remove from heat. Allow to steep for 15-30 minutes. Meanwhile prepare your ramekins. Set them in a baking dish with sides (you’ll pour in water later). In a medium bowl whisk eggs until just combined. You do not want to beat them like you would scrambled eggs. You want to avoid too many bubbles. Set aside. Ok, now for the only really intimidating part—caramelizing sugar, then pouring it quickly into each ramekin. In a heavy-bottomed saucepan set over medium heat add remaining ½ cup sugar and 2 tablespoons of water and stir. Cook the sugar until it turns syrupy and amber in color. Be patient, it takes about 7 minutes. It will bubble but don’t stir; you can use a spatula to push the syrup down the sides of the pan. Now you’ll need to work quickly and pour the syrup into the bottom of each ramekin, making sure to coat the entire bottom (just tilt them around to evenly spread the sugar). If the sugar cools too fast, set it back on the stove and gently heat up again. You’ve got this! Allow the ramekins to cool for a couple minutes. Now strain the lavender cream. And gently stir this into the eggs (it shouldn’t be hot). If cream is still a bit hot, temper the eggs by adding just a little liquid to them first, preventing them from scrambling. Divide the cream among the ramekins. Pour warm water into the baking pan so it comes up halfway on the ramekins; cover everything with foil. Carefully transfer to the oven and bake for 45-50 minutes. Check them after 45 minutes. 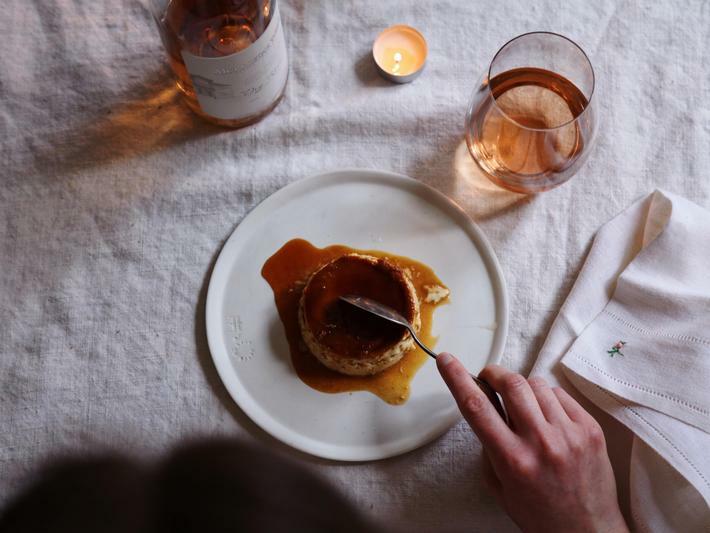 The flan should jiggle slightly but be set. Allow to cool before covering each with plastic wrap and then refrigerating for at least 4 hours before serving. To serve, place the bottom of a ramekin in hot water (this will loosen the bottom and warm the sugar syrup) then, using a knife, loosen the sides all around before inverting the flan on a plate. tada! Way to impress yourself and everyone at the table. Continue the process with the remaining flans. Some notes on mussels. Buy them super fresh and use them quickly, ideally within a day. Mussels are alive when you buy them and to keep them alive you can’t “suffocate” them in the fridge in a closed bag. One way to store them is in the coldest part of the fridge with ice over (but set in a colander over a bowl, so as the ice melts, it drips through into the bowl and the mussels don’t sit in water). If they’re closed, that’s an indication that they’re alive and well. If you’ve got open mussels, give them a tap, if they close, that’s good, if they don’t, toss them. Before you’re ready to cook, give them each a really good scrub with a brush under cold water and pull off the stringy “beard”. Grip it (with your fingers or a paper towel) and tug toward the hinge-end. Now they’re ready for your pot! Place a large pot over medium heat; swirl in butter. Once hot, add shallot, garlic, curry paste, and dried basil with a pinch of salt. Stir for 5-7 minutes until softened and fragrant. Pour in wine, and let it evaporate almost completely. Now pour in fish sauce, soy, coconut milk, and lime juice with a big pinch of salt and a few cracks of pepper. Turn heat down, cover and simmer for 10 minutes (even longer so the flavors meld together if you’re hanging out in your kitchen doing other things). 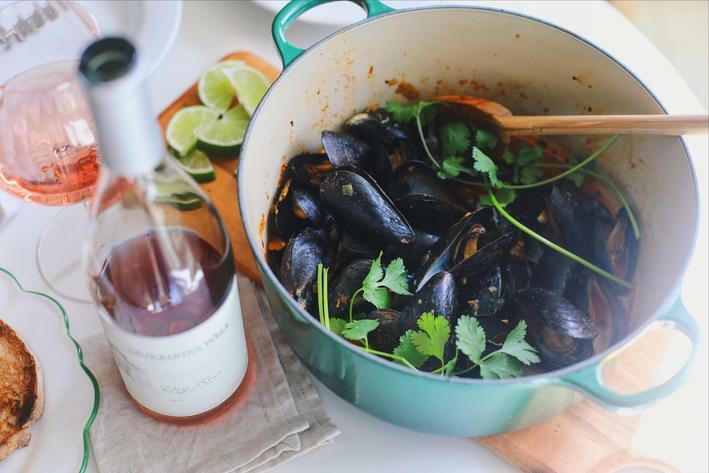 When ready to add mussels, turn heat back up to medium, and add them to the pot. # Cover again, shaking the pot every so often, for 5-7 minutes, until all the mussels have opened up. Toss in herbs and spoon hot broth into mussels so they get a hit of the flavor. Serve with bread and lime wedges. Set a saute pan over medium heat and swirl in oil. Once hot add onion, lemongrass, ginger, garlic, and crushed red pepper with a pinch of salt. Sauté for 7-10 minutes until softened and starts taking on a little color. Toss in a handful of minced cilantro stems here too (optional). Turn up the heat to medium-high. Add lamb and begin breaking it up with your spoon into the tiniest bits you can. Sprinkle with chile powder, garlic powder, basil, and pepper; stir, and leave undisturbed for a few minutes at a time, until browned and crispy in some parts, about 10 minutes total. Add fish sauce, soy, sugar, and a splash of water or dry wine to scrape the browned bits from the bottom of the pan. Cook for another 10 minutes, stirring occasionally. Squeeze in lime and taste for salt, adding more if needed. You might decide you need more soy or fish sauce too. 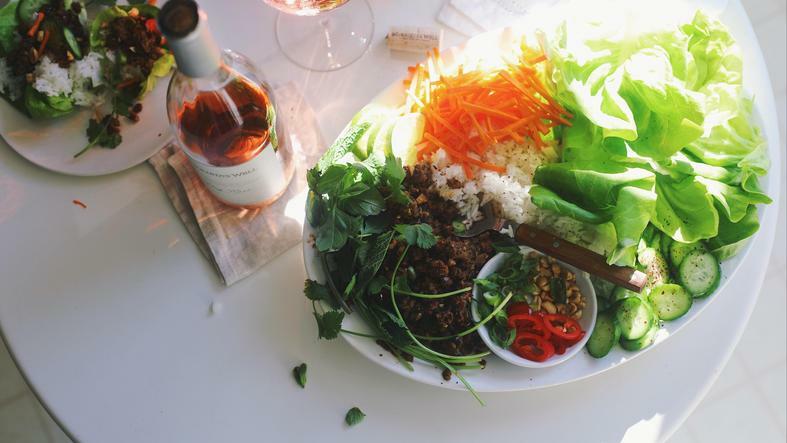 Spoon onto a large platter with lettuce cups, rice, cucumbers, carrots, peanuts, and cilantro. 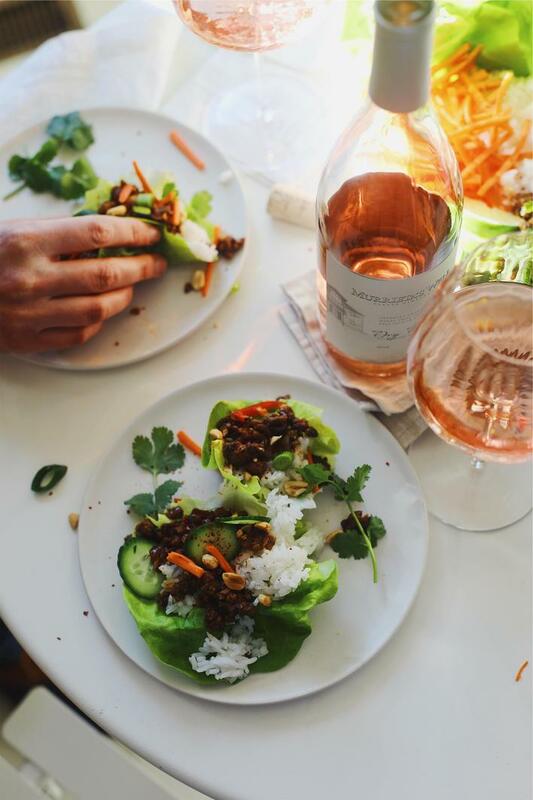 Let everyone assemble their own lamb lettuce wraps. Butter an 8×8 baking pan and preheat oven to 350°F. Combine all the dry ingredients in a bowl—almond meal, ½ cup coconut, oat flour, baking powder, and salt. In a large bowl, beat the butter and sugar until light and fluffy, about 5-7 minutes. Add in the eggs, one at a time, then pour in the coconut milk and vanilla, mixing just until combined. Fold the dry ingredients into the wet and pour into the prepared pan. Sprinkle remaining coconut on top. Slide on the middle rack for 25-30 minutes or until edges are a deep golden brown and a cake tester comes out clean. Let cool, the cake will continue setting as it sits. 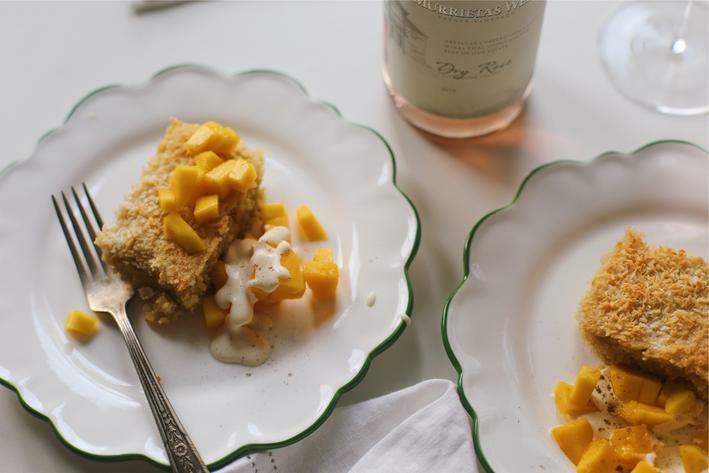 # # Serve slightly warm or at room temperature with mangoes and cream.